I am all about productivity. Yes, I do have my hits and misses but I always see to it that I get things done. You may have read my 14 Days to a Productive Life e-Course and I have enjoyed sharing to you my tips and tricks when it comes to intentional living. If you've watched my What’s In My Iphone video you'll know I don't have that much productivity apps. I only use my Sunrise Calendar and the rest are in my bullet journal. Yes, a bullet journal is my main productivity tool. However, due to my busy schedule and for the overwhelming blessing happening at the moment with my work, my blog and my freelance writing career… I knew I needed to download some helpful apps to really manage everything. Today I am sharing to you some of the Best Time Management Apps You Need to Download! This is such an amazing app if you have so many tasks to do but don't know how and where to start. With 30/30 you can set a timer as you start to tackle your to do list. All doable actions are perfect with this app. It is a super simple task manager that will definitely help you get things done. This can be you all-in-one digital notebook. You can write tasks, upload files, take pictures and more with Evernote. Most productivity bloggers I know like my idol, Michael Hyatt uses this app to manage his everyday life. I have tried this before but I am not "hiyang" with a digital notebook. I love to write my to do's and all in a physical notebook. This is a more advance application than 30/30 but still gives a friendly user interface. Your things to do can be scheduled for each day and you can also organize your list in categories. It can be synced to Chrome items making it accessible anytime, anywhere. RTM is a classic productivity app that almost everyone swears by to help people become more organized. You arrange all your tasks in one place like appointments, grocery list, blog activities easily. It also offers a color code system for a better view. For entrepreneurs and project managers, this app will be a great help. It is known as a cross-platform to-do list manager with multiple customization options available. The above five apps are perfect companion at times when you feel like there's too many things to do yet so little time. If you have some app recommendation then make sure to share at the comment section below. 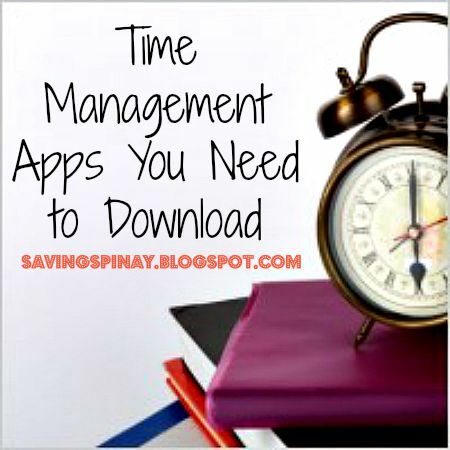 1 comment on "5 Time Management Apps You Need to Download"
List here matters a lot for accurate sort of time management. But do you ever believe that without time being tracked be managed effectively. Let's assume that we are able to manage also upto some extent but then and there we will come up with questions that where we lost x amount of time? It's been more than a decade I had been in the industry of sales and marketing where in time has been considered as one of the most appropriate and valuable term to make the progress effective. To my best I had been associated with lots of tools like Trello, Dovico, Replicon, Tsheets. Over the period of time I had got a good grip of a proper management of time and intuitively having a proper management of the same.